I rushed home from work, parked the car illegally (to hell with you, meter maids! ), and picked up the farm share. While I love the farm share I get extremely annoyed waiting in line to get the vegetables. It's very simple: the vegetables are laid you, you just put one of everything in your bag and leave. For some reason the line moves exceptionally slow so that it takes about five minutes to collect your week's share. I'm confidant that if the line was not occupied by all these slow pokes I could easily put nine or ten items in a bag in under twenty seconds. I guess I should be grateful to all these molasses-shoed slugs because without each other we wouldn't be able to enjoy the farm share. However, I am much happier being annoyed than being grateful and I'm going to leave it at that. 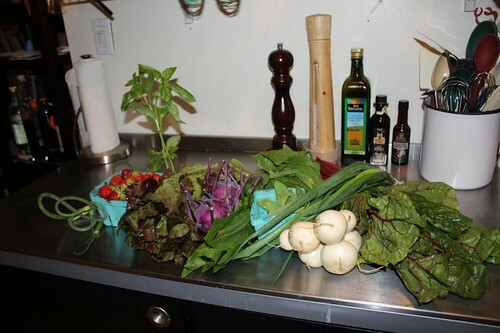 The second week of this farm season brought us: snow peas, dandelion greens, red romaine lettuce, garlic scapes, Swiss chard, Japenese white turnips, basil, scallions, kohlrabi, and strawberries. 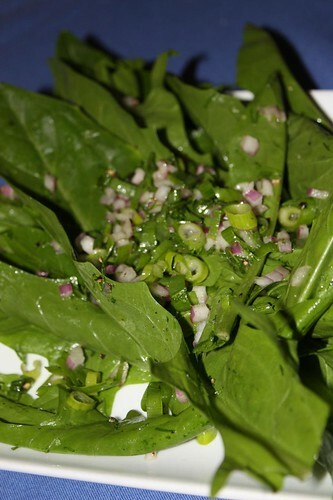 I made a salad out of the dandelion greens tossing them with some sherry vinegar, red onion, olive oil, dill, and green onion. I made a few errors: 1) I served the leaves whole (one of Jen's pet peeves), 2) I used a plate that was clearly too small, and 3) I probably should have cooked the greens since these were a little too mature to be tender. My local fishmonger (or is he a clammonger since he mongered me up a bunch of clams?) had some beautiful littlenecks from Sandy Hook, NJ. 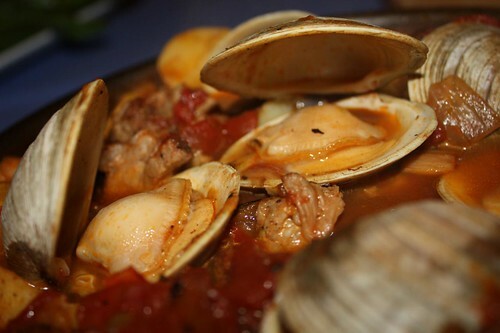 Finally I was able to relive my dream by combining yesterday's pork leftovers with the littlenecks for something approximating Portuguese pork and clams. Jen spent most of the dinner talking about how she'd never heard of Portuguese pork and clams and I spent most of the dinner faking outrage on behalf of my friends in East Providence and Fall River. 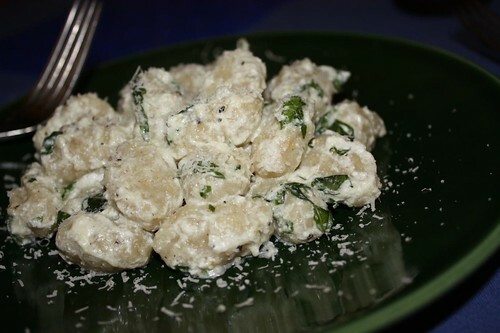 For the third course I cooked up some Severino gnocchi and then tossed it with some part skim ricotta, chopped basil, and topped it with Parmaggiano Reggiano. The result ended up being far more delicious that I'd anticipated. Sometimes it pays to be lazy. 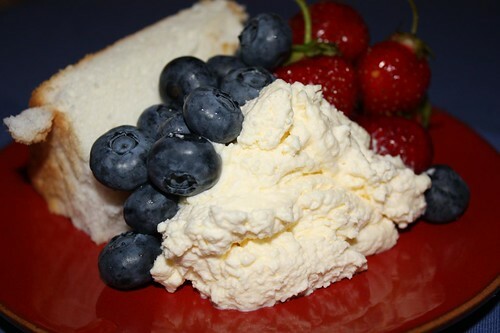 Apart from the farm berries I also picked up some local New Jersey blueberries from Jersey Fruit. Apparently down in south Jersey they turn off the Whitesnake and stop working on their Camaros just long enough to grow some really delicious blueberries! With the challenge of day one's surprise ingredients over we only need find a main course suitable of all this produce for tomorrow. Hopefully the gods of the markets will be smiling down on me.